The University of Scranton Weinberg Memorial Library presented students with research awards at a reception held on campus recently. From left: David Dzurec, Ph.D., associate professor of history; Brian Conniff, Ph.D., dean of the College of Arts and Sciences; Maura C. Burns, recipient of the 2018 Bonnie W. Oldham Library Research Prize in the Undergraduate Upper-level Category; Charles Kratz, dean of the library and information fluency; and Donna Witek, information literacy coordinator. 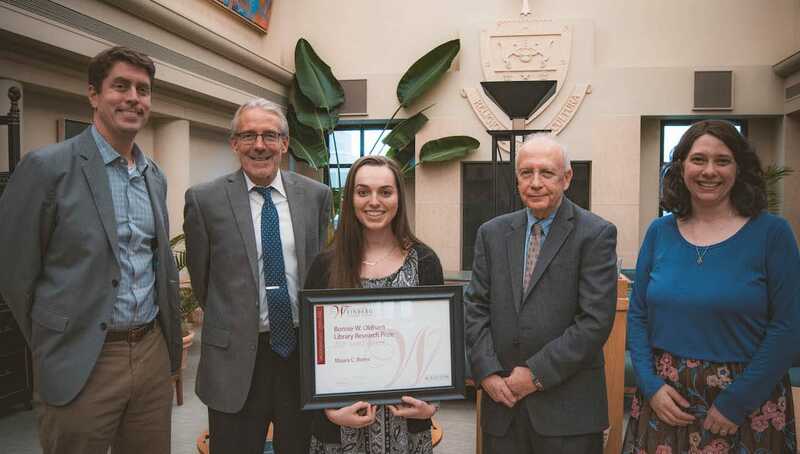 Charles E. Kratz, dean of the library and information fluency at The University of Scranton, awarded the 2018 Bonnie W. Oldham Library Research Prize in the Undergraduate Upper-level Category to Maura C. Burns of Jessup, a senior history major with minors in biology and biochemistry; the 2018 Bonnie W. Oldham Library Research Prize in the Undergraduate Foundational Category to first-year accounting major Nicole Cavanaugh of Dallas; and the 2018 Bonnie W. Oldham Library Research Prize in the Graduate Category to occupational therapy student Emily Dineen of Bethel, Connecticut. The Weinberg Memorial Library at the University inaugurated the prize in 2011 to recognize excellence in research projects that show evidence of significant knowledge of the methods of research and the information gathering process, and use of library resources, tools and services. In 2017, the prize was named for Professor Emerita Bonnie W. Oldham, who founded the prize at the University in 2011. Honorable Mention awards in the Undergraduate Upper-level Category were presented to Catherine McManus of Brookfield, Connecticut, a junior biology major with a minor in political science, who submitted her paper “Exploring the Interaction of Climate Change and Rapid Evolution Through the Expansion of Invasive Weed Ranges” that was completed in the course Evolution (BIOL 375); and to group partners Luis Melgar of Simpson, a senior exercise science major with minors in Spanish and theology, and Julianne Burrill of New City, New York, a junior exercise science major, for their project “The Effects of Dynamic and Static Stretching on Acute Lower Extremity Flexibility,” completed in the course Research Methods (EXSC 448). Cavanaugh, winner in the Undergraduate Foundational Category for projects completed at the 100-level, submitted to the competition her paper “There’s No Gain in the Globalization Game,” completed in the Composition course (WRTG 107), taught by Dawn D’Aries Zera, adjunct professor of English and theatre. To complete her research, Cavanaugh took advantage of the Library’s Research Services, made available to students at the Research Services desk on the second floor of the Library. By visiting the Research Services desk and consulting with the faculty Librarian working there, she learned the vast amount of information available to students through the University’s Library resources. As Cavanaugh states in her application essay, “A few clicks from the university homepage and I was connected to thousands of media sources, books, magazines, articles, journals and more.” She also describes as part of her research process the importance of organizing the information she found into the main points of her paper’s outline through the combined use of a research log, the citation generators in the Library’s databases and folders on her computer, all of which she used to organize and cite the sources she found. Honorable Mention awards in the Undergraduate Foundational Category were presented to group partners James P. McKane Jr. of Archbald, a history major, and Alana Siock of Jefferson Township, a French major, for their Digital History (HIST 190) course project “The Jesuit Takeover of the University of Scranton;” and to physiology major Sydney Vanvourellis of Hillsborough, New Jersey, for her essay “Is Stress just in your Head?,” completed in her Composition course (WRTG 107). Prize winners were honored at reception in the Heritage Room of the Weinberg Memorial Library. For more information about the Bonnie W. Oldham Library Research Prize, contact Donna Witek, information literacy coordinator at the University’s Weinberg Memorial Library, at 570-941-4000 or donna.witek@scranton.edu. 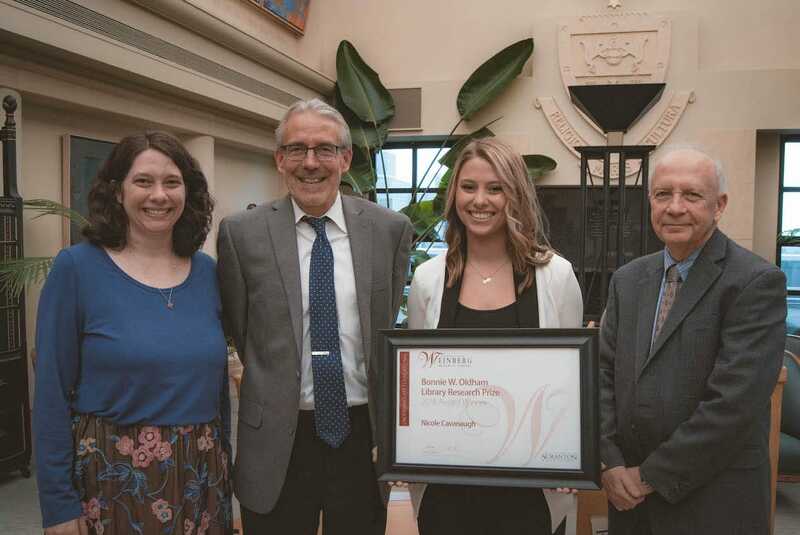 (Above photo) From left: Donna Witek, information literacy coordinator; Brian Conniff, Ph.D., dean of the College of Arts and Sciences; Nicole Cavanaugh, recipient of the 2018 Bonnie W. Oldham Library Research Prize in the Undergraduate Foundational Category; and Charles Kratz, dean of the library and information fluency. (Above photo) From left: Donna Witek, information literacy coordinator; Emily Dineen, recipient of the 2018 Bonnie W. Oldham Library Research Prize in the Graduate Category; Charles Kratz, dean of the library and information fluency; Marlene Joy Morgan, Ed.D., associate professor of occupational therapy; and Victoria Castellanos, Ph.D., associate dean of the Panuska College of Professional Studies.